The act of adoption can be seen as the most selfless act of love for all parents involved. Birth mothers give up their own flesh and blood to provide a better life for their child while adoptive parents bring in a young outsider with the same goal. One area that has intrigued many Americans is how the adopted child understands their situation. Based on their age, the reaction can be vastly different. As a quality alternative to any adoption agency in California, A is 4 Adoption is here to provide the best services possible to ensure the best outcome for all parties involved. From comprehensive birth mother help to guidance and assistance for adoptive parents, our adoption center is here to set the standard for how the process should be done. Today, we’ll look at how children understand adoption as they grow older and the effects that their development can have on the family dynamic. If you are considering putting your child up for adoption, or you are thinking about adopting a baby, be sure to contact us to learn more! Adopting a child soon after birth will create an interesting balance in your family, where your new miracle child will be with the family for a crucial series of developmental attachments while still remaining biologically different. From such a young age, the child will begin to bond with the most important characters in his or her life. This is typically the mother, father, or both. Proper support and encouragement is vital for this stage, as the process of developing a secure attachment to the parents helps to lay the groundwork for a lifetime of trust and nurturing behavior. It is important to note that several factors play into the child’s initial development, including the length of gestation, genetic issues, drug and alcohol activities, and many more. Our private adoption experts are here to offer the support needed by both sides to create a positive, supportive environment for everyone. As the child enters his or her toddler phase, the process of imagination and storytelling compels them to indulge in their curious ways. This may be an acceptable time to explain to your child about their adoption, although the core concept cannot be comprehended. While they enjoy explaining where they came from and the imaginative way in which they came to be, children at this age lack the real understanding of how human reproduction works. Understanding how time truly works is an important part as well, as toddlers cannot comprehend how to explain past and future events. Piaget’s idea of object permanence comes into play here, as young children struggle to understand how items exist even though they cannot be seen. By two years old, most children will understand object permanence and adopted children may begin to understand the notion that they are uniquely different from other kids. As we have said, adoptive parents may be able to begin telling their child that he or she came from a different mom and dad and explain that they were here to be the new parents to help the birth mom with raising a kid. At this stage, many parents decide to hold off on telling the truth, as it can be a lot to handle for a young child. It’s important to remember, though, that openness and honesty are conducive toward creating an open and nurturing relationship between adoptee and the parents. Starting your conversations early may prove useful in laying the groundwork for a lifetime of communication and understanding. 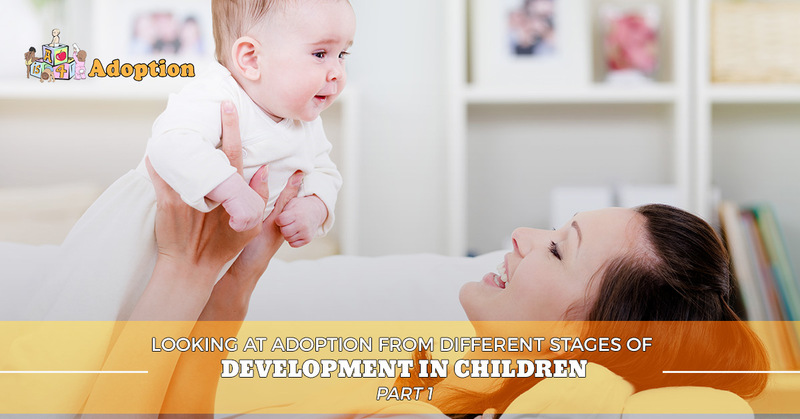 Understanding the link between human development and the psychology surrounding adoption can help many adults to be better prepared for the challenges and rewards involved with adopting a child. Next time, we’ll look at the later stages of childhood and how new mental skills and processes interact with this often-complicated subject. A is 4 Adoption is here to provide any and all support to all parties involved during the adoption process to ensure that the child at the center of it all has everything they need to thrive in life. From personal experience, we understand how frustrating adopting a baby can be, which is why we work hard to make the process a better experience for everyone. Contact us today to learn more about what we do!